In his own words….“I made this album in August 2003 with an amazing couple that I met at a venue called the Hideout in Chicago in 2001. Mark the producer has a small label called India records in Austin, TX. This particular night was a showcase for the label that I stumbled upon with a friend of mine called Zoran and 3 Birriers (i.e. people from Birr, Co. Offaly!!). 3 acts played, Will Sexton, brother of Charlie Sexton who played guitar with Bob Dylan. Kitty Gordon, Jeff Klein and Sheridan played too. I loved the music and the fact that they all backed up each other’s performances. I bought all their albums that night and having been to Austin, Texas a couple of times and fallen in love with the place I thought that it would be the next place to record. The reasons being.. I bought the hat from 24*hotel there,…Townes van Zandt, I saw Lucinda Williams there and the fact that I could sleep on the couch of Mark Addison and his wife Nina and make a back to basics record.” Raining Down Arrows went to number 1 in Ireland and again over a period of a couple of years became a favourite with Mundy fans, it also allowed him to return to the UK to tour where he supported Jimmy Webb and Josh Ritter as well as playing as series of headline shows in London at the likes of the 100 Club, Bush Hall and The Academy and solo shows in France and Holland. 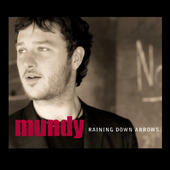 More solo shows around the UK and his continuing popularity in Ireland helped ensure Mundy’s career was going to survive the vagaries of the business. Some called this his country record but in truth ‘By Her Side’, ‘Love & Confusion’ and 10,000 Miles Away From Harm indulged Mundy’s passion for Crazy Horse and The Replacements as much as Townes Van Zandt. Mundy got to do a solo tour of the UK with Jimmy Webb during this time, Webb was the author of classics like Witchita Lineman, Galveston, By The Time I Get To Phoenix etc.